My sister Tina, my BFF Grace and I exchange Christmas lists sometime in November; this year, I asked for a subscription to Cook’s Illustrated. Grace gave it to me and I have been happily devouring the bi-monthly issues. I love CI because the authors always explain the benefit of a given technique or treatment. 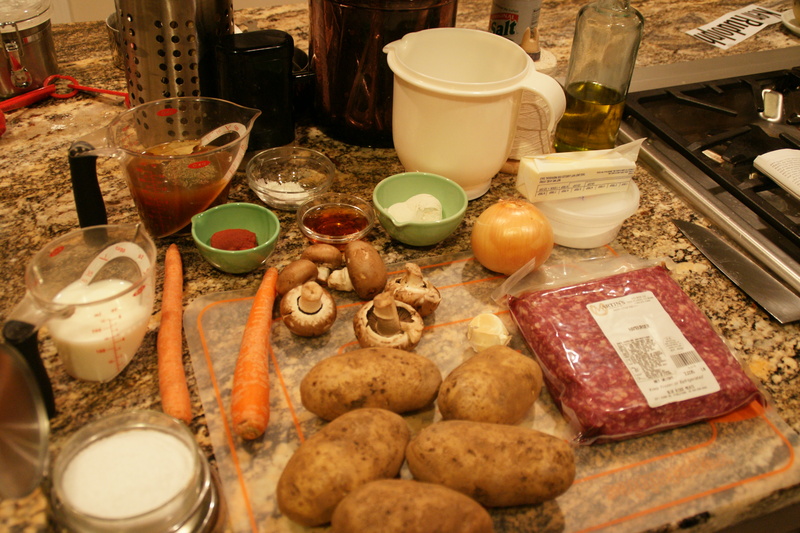 Since it’s winter and we’re expecting snow tomorrow after a 75-degree day yesterday, I thought I’d try the shepherd’s pie; what intrigued me was the fact that baking soda is added to ground beef to soften it. 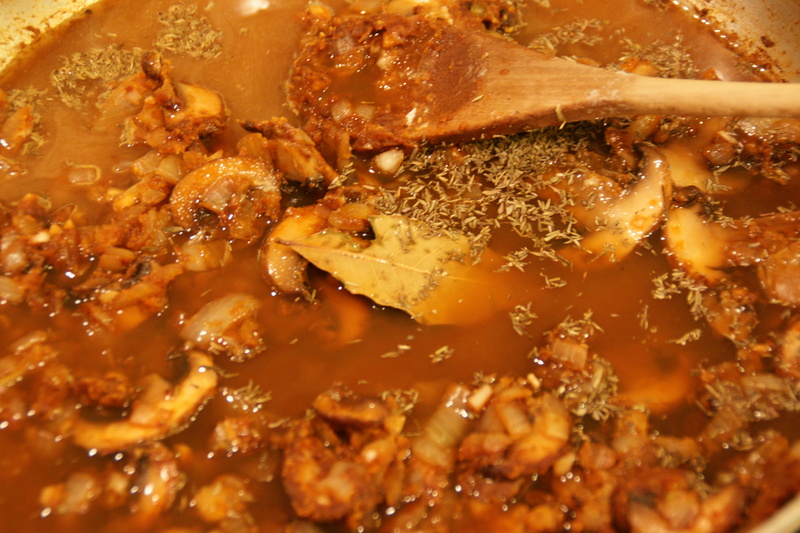 This treatment keeps the meat in chunks rather than the non-treated result of crumbly, pebbly bits floating around in the gravy. I made slight changes to the recipe; I omitted the green onions for the mashed potatoes because of Ken (“What’s this green stuff? I hope it’s not PARSLEY”) but I think they would be a great addition. I substituted Marsala wine for the Madeira/ruby port as I had neither, and I used dried thyme as the thyme on my deck was looking too sad. It’s a bit ingredient-intense, so get everything ready ahead of time. 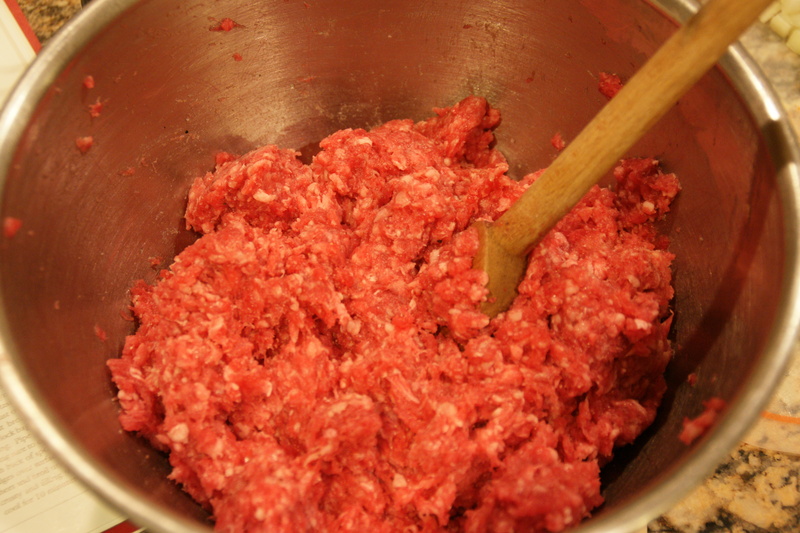 Prep the ground beef by adding the water, salt, pepper and baking soda. Mix well! Let rest 20 minutes. “Softening” the ground meat so it stays in chunks! Place the potatoes into a pot with water to cover. Salt the water. Bring to a boil, reduce to a simmer and cook for 8 to 10 minutes until tender. Drain and place pot back on the stove over low heat to evaporate excess water. Off heat, add the melted butter and mash well. Beat the egg yolk and milk together and mix into the potatoes. Season to taste, then cover and set aside. In a medium broil-proof pan (CI suggests 10 in, but I went bigger), heat olive oil over medium high heat. 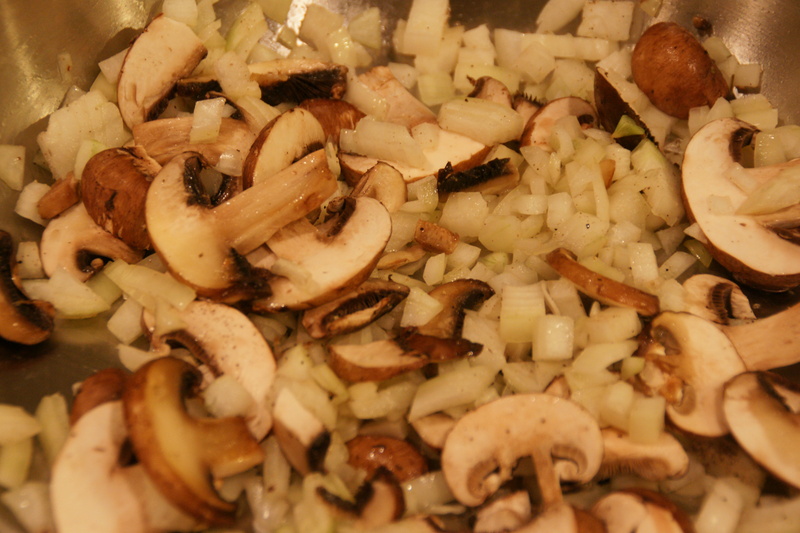 When the oil begins to shimmer, add the onions and mushrooms. Season with salt and pepper. 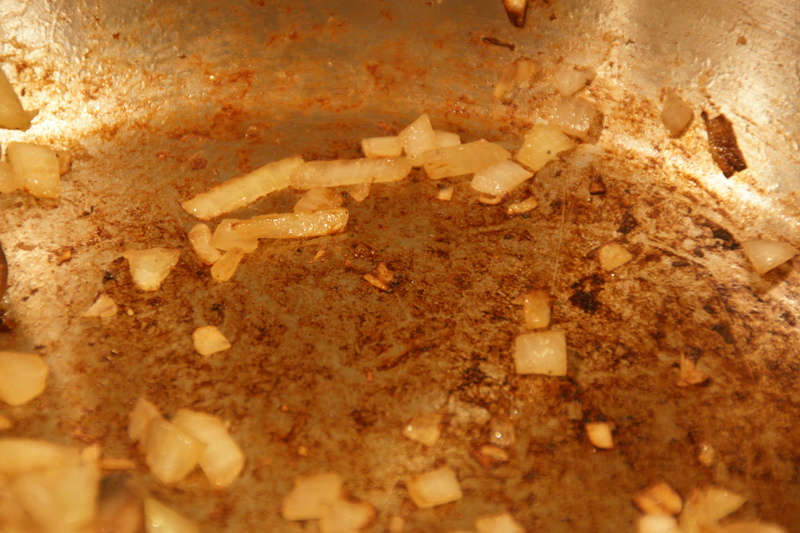 Saute until vegetables are soft, and beginning to leave brown bits on the bottom of the pan, about 5 minutes. 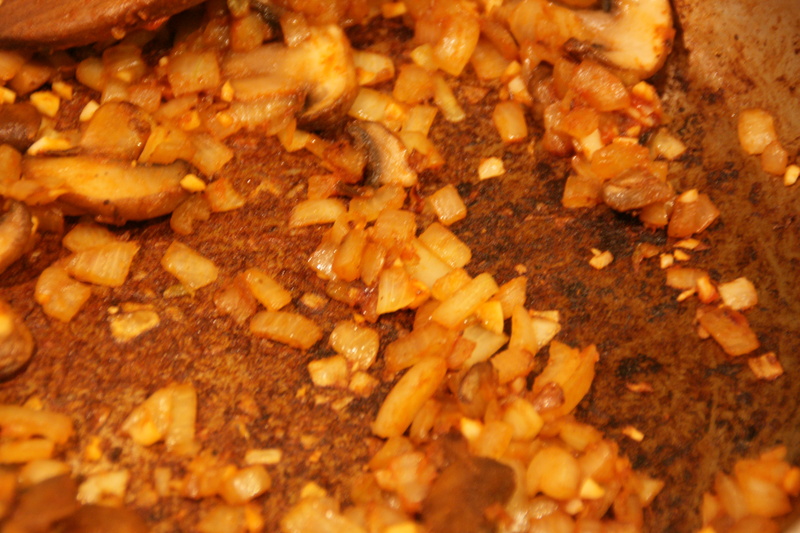 Add the garlic and tomato paste and continue cooking until paste turns brown and covers the bottom of the pan. Add the Marsala, scraping up bits from the bottom of the pan. Add the flour and cook briefly, about 1 to 2 minutes. 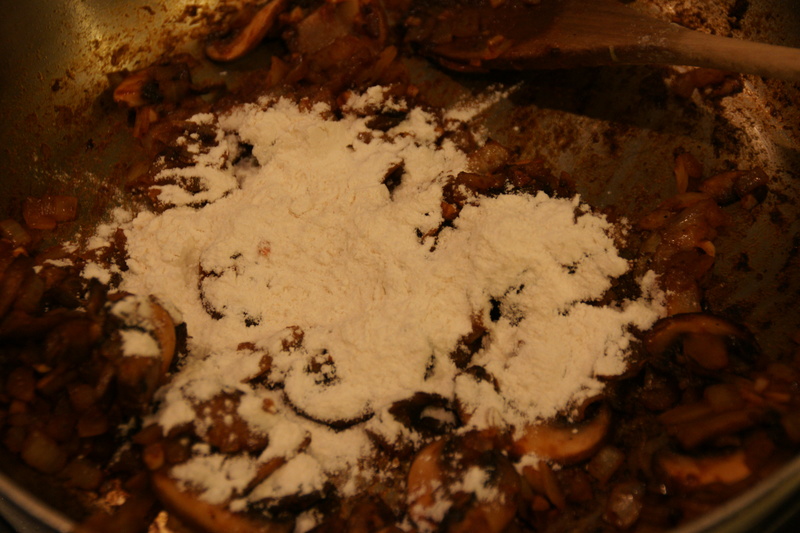 Once the flour is mixed in, the contents of the pan look a mess, but do not fear! Add the broth, Worcestershire, thyme and bay leaf. Continue to scrape up bottom of the pan and then add the carrots. It’s beginning to look like a stew now! 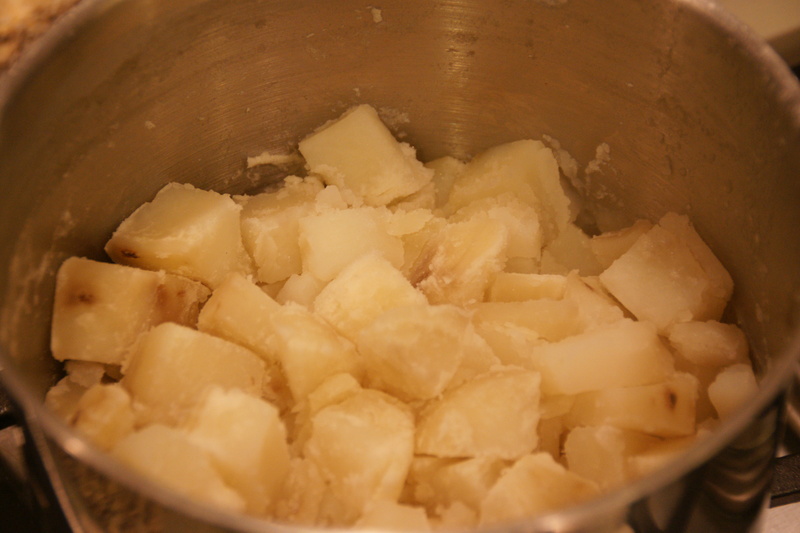 Bring to a boil, scraping up any remaining bits on the bottom. Reduce the heat and add beef in 2-inch chunks over the sauce. Bring to a gentle simmer, then cover the pan and cook for 10 to 15 minutes. About half-way through, break up the beef chunks with two forks. 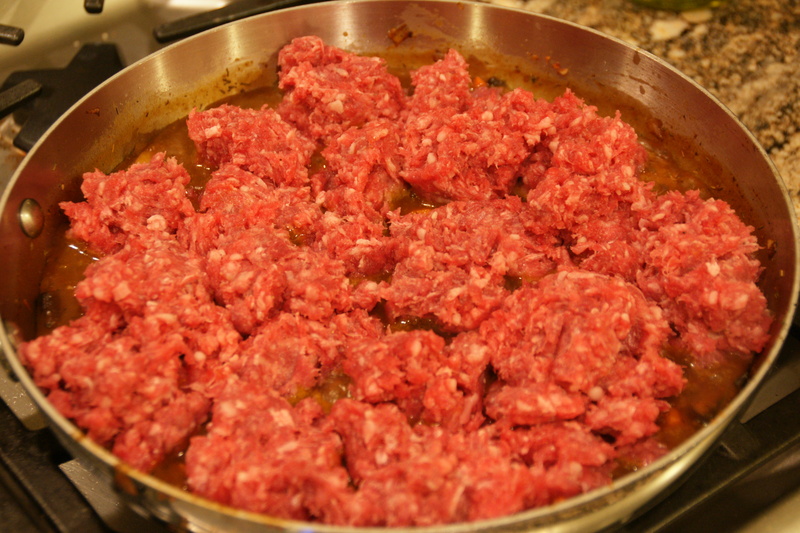 When meat is cooked through, mix 2 tsp water with the cornstarch and stir into the pan to thicken, about 1 minute. Remove pan from heat. Preheat the broiler with a rack 5 inches from the heating element. It’s a bit crowded, so be careful stirring the slurry into the stew! Load a gallon ziplock back with the mashed potatoes. Seal bag, pressing out excess air. 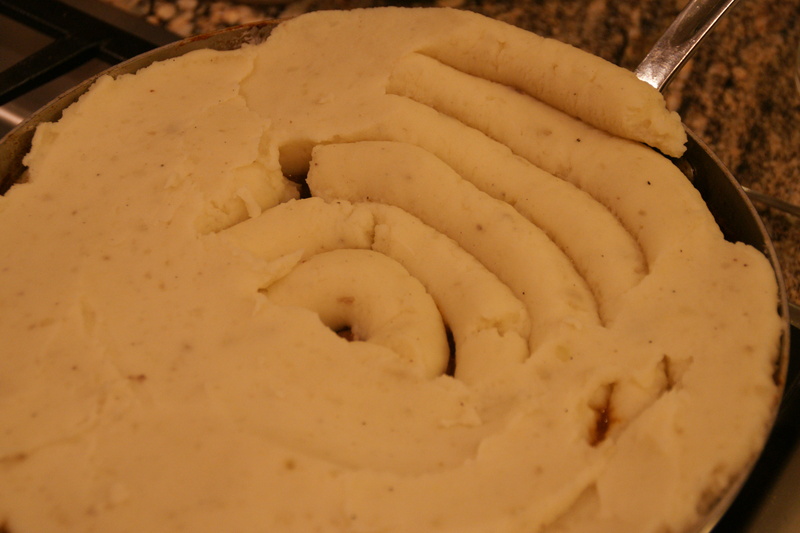 Snip off one corner to make a 1-in opening and pipe mashed potatoes over the beef mixture. 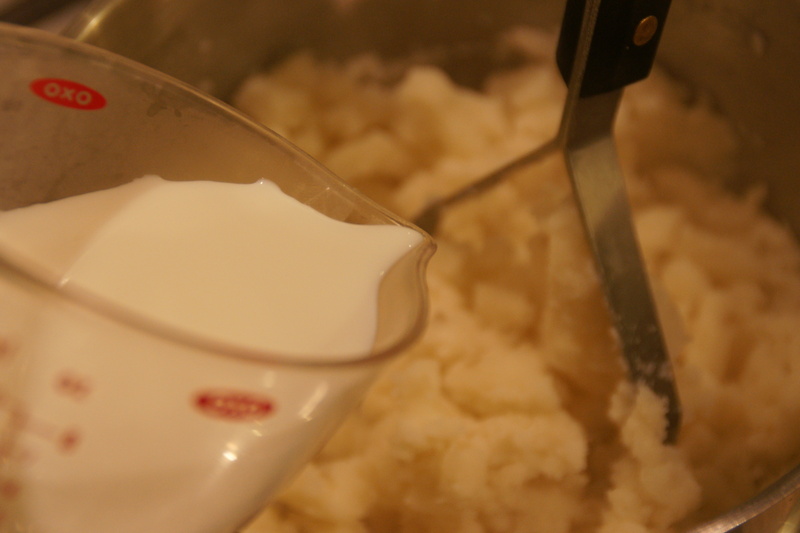 Using an off-set spatula, smooth the mashed potatoes. Using a dinner fork, create ridges across the potatoes. I thought piping was overkill, but it made spreading the mash so much easier! 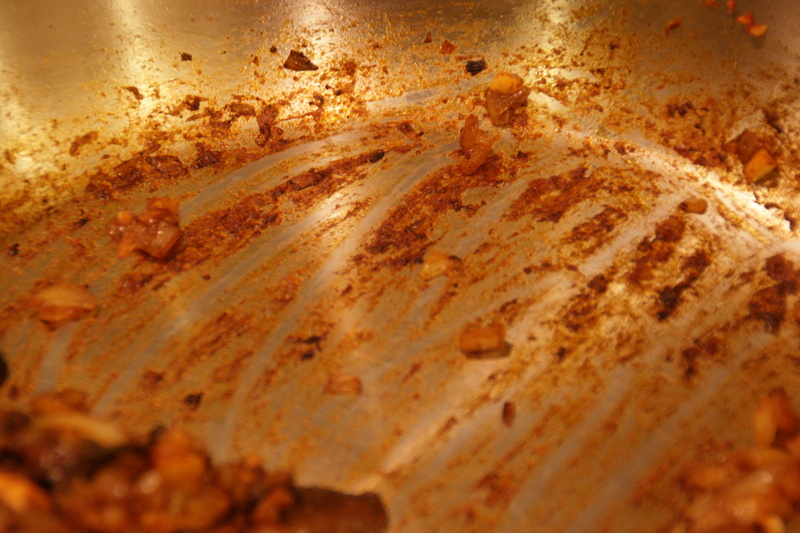 Place the pan on a rimmed cooking sheet to catch any spillover and broil for 9 to 12 minutes until topping is brown and juices are bubbling. The ridges allow the potatoes to get crispy; clearly, there are fancier ways to do this, but the natives were getting restless! My broiler was way too powerful for the poor mashed potatoes, even with the oven rack 5 inches away. I’m lucky I checked after a few minutes because the ridges were beginning to burn! I moved the rack to the center position and went from broil to baking at 475 degrees. Broiling on the center rack next time will fix the problem. 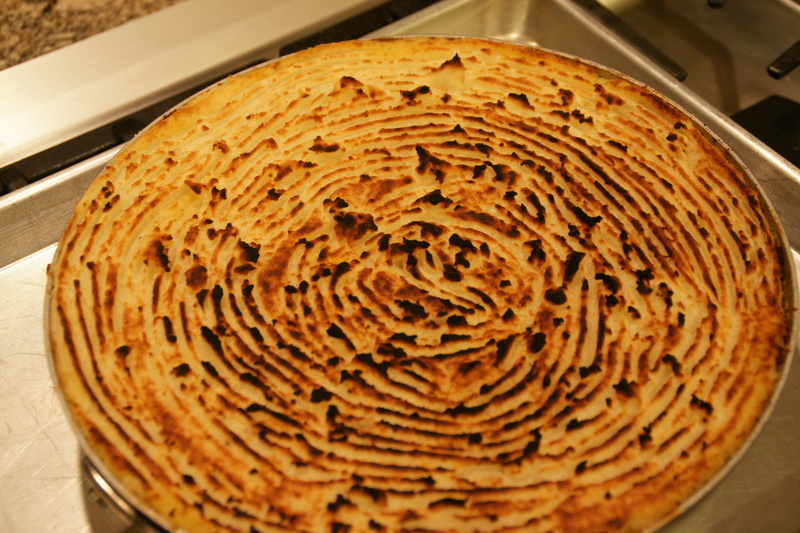 It was a lucky save; I did NOT want to re-do the mashed potato layer! 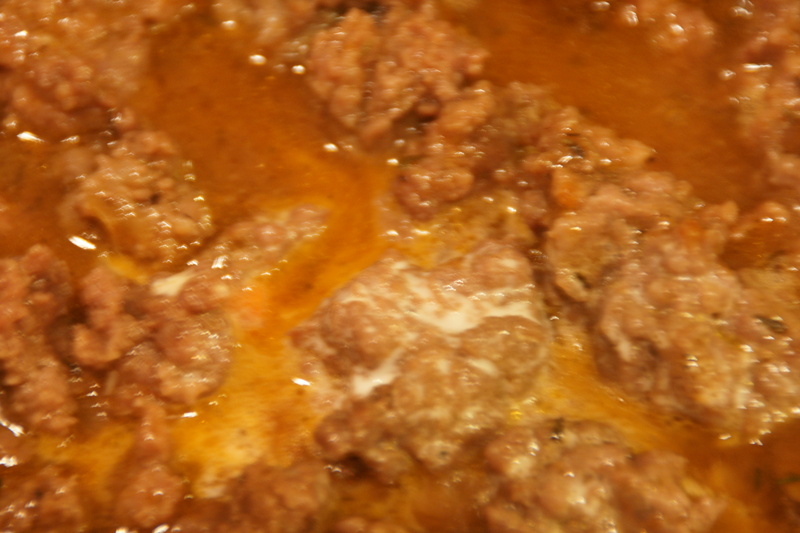 The texture of the meat was fantastic– chunks of ground beef that were juicy; Kurt suggested I try to do the same technique with ground lamb (the traditional meat for shepherd’s pie). 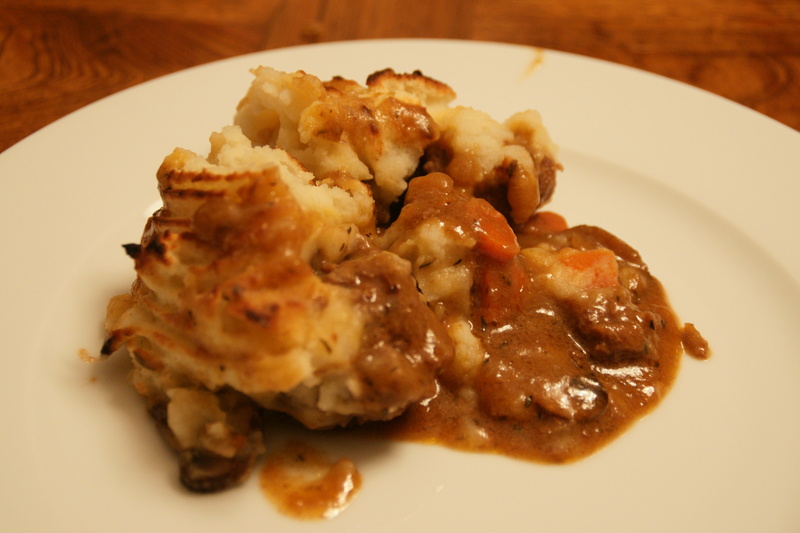 The mashed potato layer was thick and delicious (despite the slight over-broil) with the underlying stew. The flavor of the stew itself was pretty good, but both Kurt and I thought the sauce lacked the rich, caramelized flavors of browned meat. After some debate, we decided that problem was either the broth (I didn’t use my favorite Pacific brand) or that I didn’t sufficiently brown the onions and mushrooms. Overall it’s a keeper; Kurt did, after all, have TWO platefuls of the stuff! 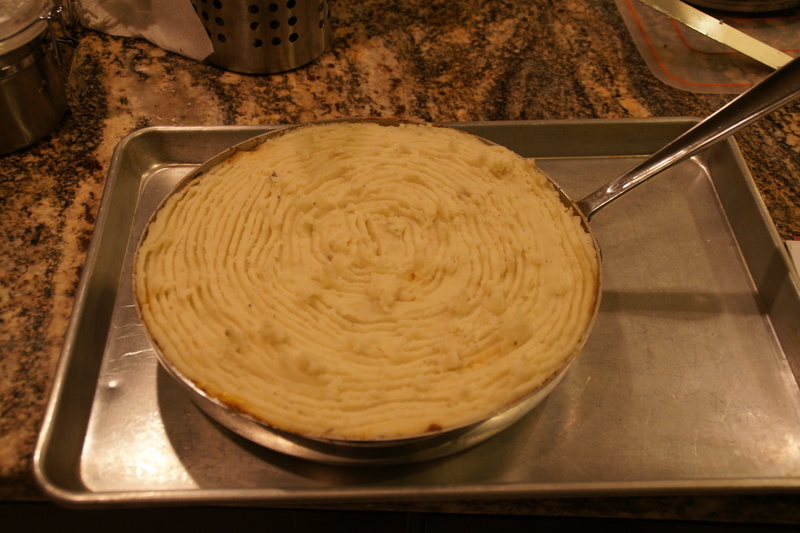 Shepherd’s Pie was a staple in my mother’s kitchen, but hers was much simpler: Brown seasoned ground with chopped onions, dump it in the bottom of a casserole dish. Open a can of creamed corn and pour it on top, then add the mashed potatoes, making little peaks so they get brown. Bake in the oven (350) until bubbly and the peaks are brown. No broiling. I still make this for my kids (their favorite, too), but I make my own creamed corn now. Yeah, I think I will avoid the broiling if it burns again! Thanks for the recipe, I shall try it. Adding baking soda to the meat is certainly worth a try. I couldn’t believe how much better texture the meat had with this simple treatment! Have fun making it! I made this last fall….it was fantastic. 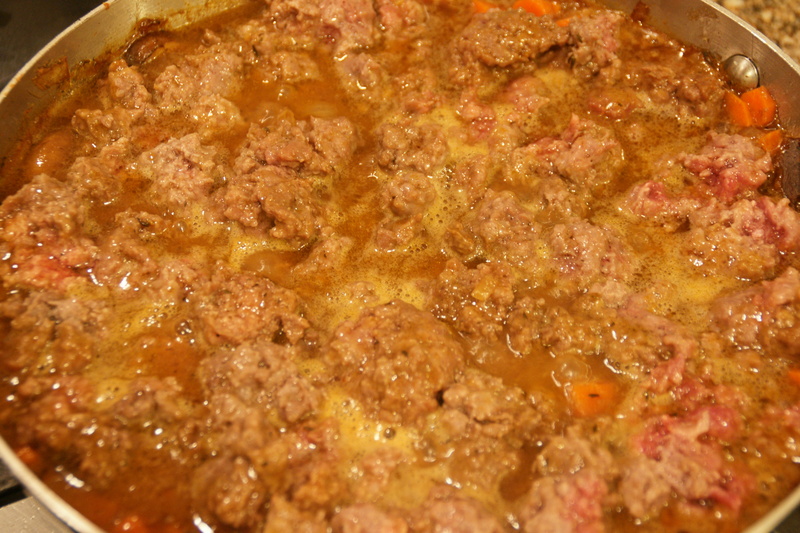 The baking soda and water added to the ground beef really works! I, too, was really surprised about the baking soda. I’ve learned so many tips and tricks from Cook’s Illustrated! stye is awesome, keep itt up! Thank you for sharing. As other people have commented on the Web, I am constantly irritated for Cook’s failure to post recipes unless a subscription to its mag is ordered. Because of my lack of fond memories about Shepherd’s Pie from the jr. high cafeteria (! ), I thought I’d try this to see if the dish really has merit! 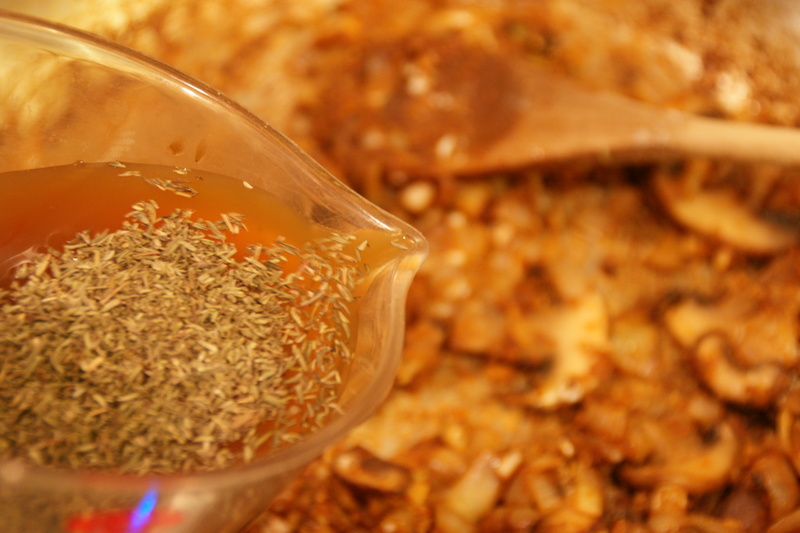 I love this recipe, when I can’t remember where I put it, I just look for blogs. My one comment about this recipe is placing the potatoes in the zip lock bag, unless you are using a piping bag, just spoon the potatoes on, spread out, then take the fork to it, it works perfectly well and I make this for 80 people. One day, I used beer instead of red wine, about six ounces of it; because it was what I had, and then reduced the mixture til it thickened, then continued with the recipe. Worked fine. Do you have a printer friendly version of this recipe? Alas, I do not. I am looking to migrate from WordPress to a host where I will be able to take advantage of more widgets.